The DC205 low-noise, high-resolution DC voltage source is the right tool when a precision bias source is needed. Its bipolar, four-quadrant output delivers up to 100 V with 1 µV resolution and up to 50 mA of current. In 4-wire mode (remote sense), the instrument corrects for lead resistance delivering accurate potential to your load. 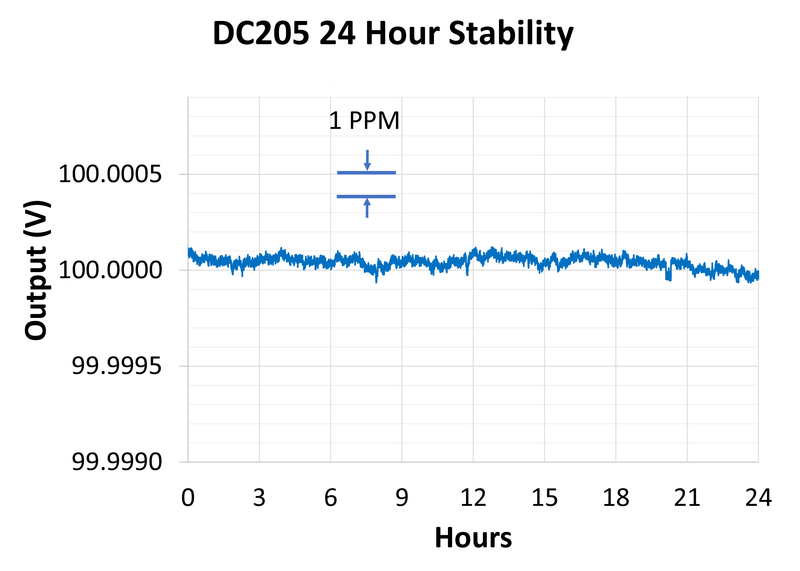 The DC205's output stability is a remarkable ±1 ppm over 24 hours. With its linear power supply, there is no need to worry about high-frequency noise. The front-panel display of the DC205 lets you set voltage with true 6-digit resolution. There are three voltage ranges to choose from: ±1 V, ±10 V and ±100 V which allows voltage settings from 1 µV to 100 V — eight orders of magnitude! The DC205 has outstanding noise characteristics - on the 1 V range, the rms noise is less than 1 µV (0.1 Hz to 10 Hz). It is also accurate to 0.0025 % over a one year period, and it has excellent temperature stability with a specification of less than 1 ppm/°C. The design even features linear power supplies rather than switching power supplies, so switching frequency interference can never be a problem. The instrument's triggerable voltage scanning feature can be useful in a number of experimental applications. The start and stop voltage, scan speed, and scan function can all be controlled. Scan speeds can be set from 100 ms to 10,000 s, and the scan function can either be a ramp or a triangle wave. Single scans and continuous scans are both supported, and the instrument can be triggered from the front panel, remotely over one of the interfaces, or from an external trigger signal. The DC205 can output either positive or negative voltages, and it operates in either grounded or floating mode. In floating mode, the output can float up to 250 V relative to chassis ground. You can also select either 2-wire or 4-wire operation. In 4-wire mode (remote sense), the instrument maintains its preset voltage directly at your load eliminating the effect of lead resistance. The DC205 has both RS-232 and USB computer interfaces on its rear panel. All functions of the instrument can be set or read via the interfaces. For remote interfacing with complete electrical isolation, the DC205 also has a rear-panel fiber optic interface. When connected to the SX199 Remote Computer Interface Unit, a path for controlling the DC205 via GPIB, Ethernet, and RS-232 is provided.